New York City Mayor Michael Bloomberg unveiled a $12 million advertising campaign intended to put pressure on swing senators in key states for upcoming gun control legislation. 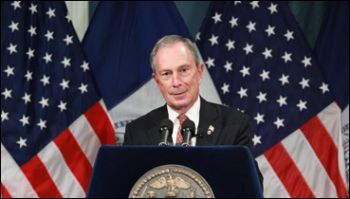 Bloomberg, a leading national advocate for gun control, announced the ad buy through Mayors Against Illegal Guns on Saturday. "These ads bring the voices of Americans—who overwhelmingly support comprehensive and enforceable background checks—into the discussion to move senators to immediately take action to prevent gun violence," Bloomberg said in a statement. Bloomberg has long been a voice for stricter gun control laws. A co-founder of Mayors Against Illegal Guns, the NYC executive has recruited over 800 mayors from around the country to his cause since 2006. While the mayor's spokesman could not confirm where the $12 million came from, the New York Times is reporting that Bloomberg is personally bankrolling the campaign. The ad in question paints a compassionate plea to Middle America gun owners across the country. A blue collar middle-aged sportsman, sits on the flat bed of a pick-up truck as he carefully cradles his shotgun. In the background, out of focus but clearly on mind, the hunter's presumed family plays idyllically by a farm. The children of America. The gun owner has much to say to fellow Second Amendment defenders. "For me, guns are for hunting and protecting my family," the man says. "I believe in the Second Amendment and I'll fight to protect it. But with rights come responsibilities. That's why I support comprehensive background checks, so criminals and the dangerously mentally ill can't buy guns. That protects my rights and my family." In a similarly filmed second ad, the hunter addresses the fears of many gun rights activists. "Background checks have nothing to do with taking guns away from anyone." The commercials come after a tumultuous week for gun control legislation. Democratic leadership in the U.S. Senate is moving ahead with a large gun control bill. While he has conceded there is not enough political support for an assault weapons ban, Senate Majority Leader Harry Reid (D-Nev.) insists that universal background checks are essential for any gun control legislation to be effective. The Senate is scheduled to begin debate on the bill after the Easter recess. Mayors Against Illegal Guns has been a long heard voice in its support for background checks. Often citing a 1990s study that suggested 40 percent of U.S. gun transfers were conducted by private sellers and not subject to background checks, the group has made the issue a focal point for stricter gun control laws. The ad buy has placed Bloomberg publicly in the way of an old political adversary: the National Rifle Association. The NRA, no stranger to disagreeing with the NYC mayor, has already fired back. "He can't spend enough of his $27 billion to try to impose his will on the American public," NRA CEO Wayne LaPierre said Sunday in referral to Bloomberg's national campaign against smoking and sugary drinks. LaPierre hopes to draw a correlation between big gulps and private gun transfers. "They don't want him in their restaurants, they don't want him in their homes, they don't want him telling them what food to eat. They sure don't want him telling what self-defense firearms to own." LaPierre promises a counter ad campaign against Bloomberg. The NYC mayor has already directly called out the NRA in his initial statements when releasing the ad campaign, which he compares to the NRA's frequent media blitzkriegs. "The NRA has just had this field to itself," Bloomberg said. "It's the only one that's been speaking out. It's time for another voice." Bloomberg also expressed regret over the absence of an assault weapons ban in the Senate bill. "You don't want to lose everything in the interest of getting the perfect." You can view one of the ads here.